The road to Hell is paved with good intentions and driven down by a big red truck. Formerly a police officer by the name of Orion Pax, Optimus Prime is the leader of the Autobots. 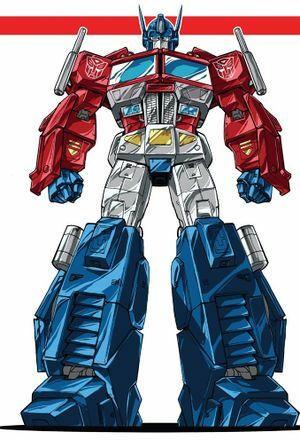 The first true heir to the title of "Prime" and holder of the Matrix of Leadership in millennia, Optimus's commitment to freedom and equality for all sentient beings is backed up by incredible leadership skills that allowed him and his forces to hold the line against the tyrannical Megatron and his Decepticons for millennia. Now that the war is over, however, Optimus occasionally feels at a loss with what to do with himself in this time of relative peace. In danger of becoming overshadowed by the other franchises? No there's no danger of that. Some months later, the deposits of Ore-13 across Earth were in a state of fission and could theoretically destroy Earth. Optimus' fears that the humans would view it as an act of aggression were well-founded as G.I. Joe became dedicated to destroying the Autobots. Confronting the humans in Portland, the one-sided fight was interrupted by the arrival of a Space Knight who slew four Joes. Knowing the Autobots would be blamed, Optimus ordered his men to follow the Knight whom they overpowered with the Knight introducing himself as Rom. Bringing the Knight back to Autobot City, Optimus learned from Windblade of a mental message from Micronus Prime requesting aid for his realm of Microspace. With memories of Prion still fresh in his mind, Optimus put aside helping Micronus for the moment. This page was last edited on 16 May 2018, at 18:07.